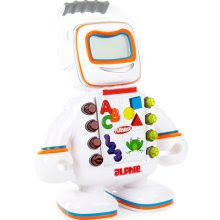 Baby Things I Want: Educational and Fun Toys! Now that the novelty of all of the new Chanukah toys has worn off, I have been able to observe which toys are truly up to par. These are two toys that my kids still love to play with, one month after receiving them. They meet all of my toy criteria: the kids think they are fun, they are educational, and they require minimal help from me. She was already adept at spatial intelligence, but this has really helped her fine tune those skills. It has also helped teach her colors and the name of the shapes. After helping her a few times and labeling each color and shape for her, she can now put all of the shapes back by herself, and in record time! He comes with 30 double-sided learning cards from which he asks questions about shapes, colors, animals and their habitats, cause and effect, vocabulary, and more. He uses fun games to promote independent learning. Plus, he’s a cool robot that says funny catch-phrases! Batsheva is a mom to two daughters ages four and almost two. In addition to reading her reviews on Baby Things, you can read about her mommy adventures at Late Night Feedings.